Just got back from a day on SF Bay with the CCK crew. This was our annual instructor 'meeting' where we talk a little business and review some on the water techniques, but generally play around and have fun. This time we met at Horseshoe Cove to spend some time in the tidal race around the corner at Yellow Bluff. 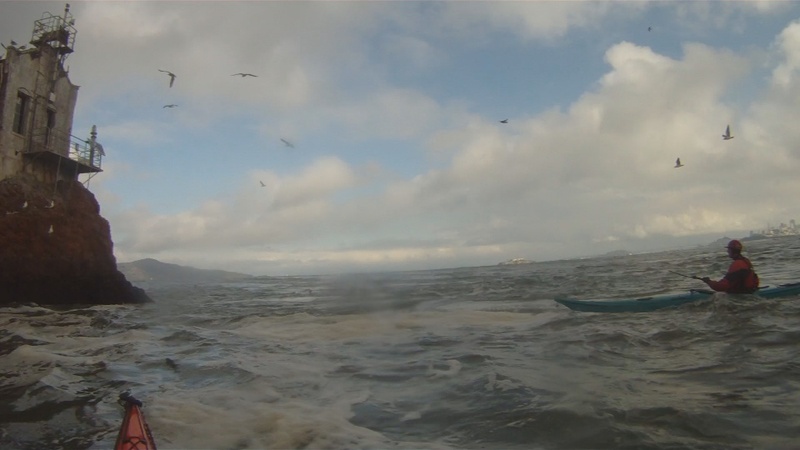 Max ebb was 4.6 knots at 1:30pm so we played around until about 1pm when it started dying (it is best an hour before max, after that the tide is too low and the waves shrink). 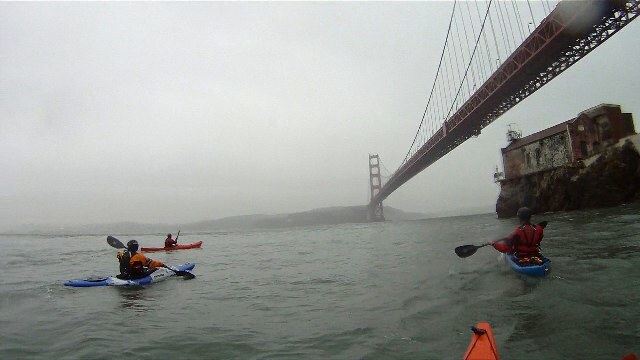 So we decided to head back in with a little swing by Lime Point (the last point just before the Golden Gate Bridge). There was a big swell outside and just inside the Point the incoming swells would push against the out-flowing current and spill over a submerged rock, creating a wave/hole to surf that often crashed in upon itself before disappearing. Several of the group smartly turned back into Horseshoe Cove before reaching the Point (which was kind of the point of no return). Several of us headed on to try out the wave. Sean Morley was the first to get to the wave and I moved in to try to get some video (sorry - battery glitch and nothing came out). A few others got in there and soon everyone realized it was a one boat wave and there was no real eddy. So one after another people started getting swept around the point - which luckily did have a nice eddy behind it where you could stop to rest and try to figure out how to get back into the bay. Did I mention that once in the eddy I looked at my watch and it was 1:30pm exactly. Max ebb. 4.6 knots. Probably accelerated a little bit by the point. The plan was fairly simple: paddle really, really hard. Success was more subtle but we were all making it work except that one of the guys is recovering from a shoulder injury and was already tired from earlier antics. He had made it around the point but couldn't quite get past the current. He was on the treadmill. I was in front but generously drifted back to hook a line up to give him a boost, thinking I could be the hero. But together we still weren't going anywhere. So I gave Sean a nod and he came in to hook up to me - now we were playing with power and I was confident Sean could tow us both in. But just then I hear the call from behind, "the line is off!". Don't know exactly how it happened but my carabiner had unclipped itself from his boat. First time I've ever had that happen. Brand new stainless steel wiregate carabiner that was in perfect working condition. Go figure. So as Sean and I are messing with ropes the current pushes us back to the wave/hole. And we're both on the wave and still tied together. Disaster seemed imminent and I braced for impact. But Sean had smartly dropped his tow belt so we both just got a ride for a couple seconds. We fell back into the eddy behind the point to untangle. Meanwhile Kenny had come back to tow the tired paddler, and eventually Bill jumped in as well to get the job done. Sean and I got sorted and paddled up to join the rest. Quite the workout for the end of the day and good lessons in planning for current, knowing your limits, having proper gear, and working in a group. Of course there was no real danger - we could have just waited a little while and had an easy paddle in. But where's the fun in that. Kayaking seems to be a very trendy thing. And by that I don't mean that kayaking itself is cool and trendy. I mean that there exist subcultures within the sport that seem to rise and fall in popularity. There's always a 'latest' fad that people flock to. Sometimes for good reason but like any trend there is often no good reason - people just follow others. Everyone like to be in the popular group. This happens with kayak brands, instructional techniques and paddling disciplines. One such trend at the moment seems to be Greenland paddling. Everyone seems to be discovering Greenland paddles and Greenland rolling. Ironic that it is the 'new' trend since it is really where kayaking got its start. I'm a purpose driven guy and I don't take to something just because it is new (or old). Personally, I understand Greenland paddling, I appreciate its history and culture, but I don't see any benefit in using a Greenland stick for the paddling I do. Same for the myriad of rolling techniques - I have never needed to roll with a stone in my hand or paddle behind my back. Nor do I plan to hunt any whales from my kayak in the near future... But there are good reasons to use the skinny sticks and learn various rolls and I have several friends who are Greenland paddlers - and still my friends. It's just not for me. Though as trends go it's probably a good one. 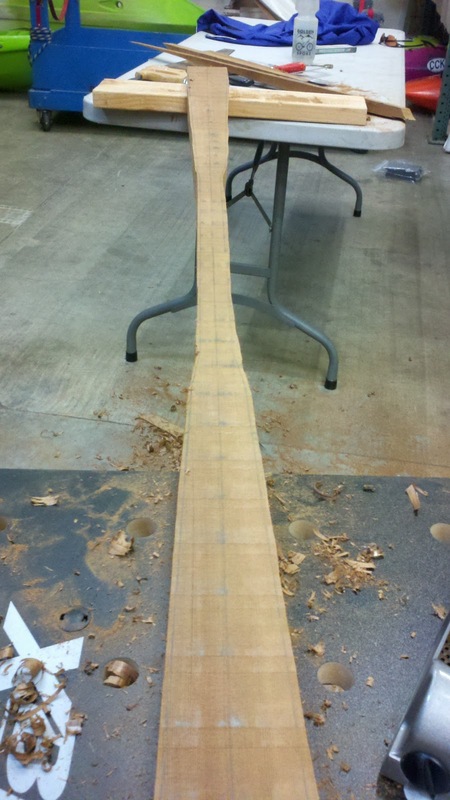 That all being said, I have started to build a Greenland paddle. To be honest, it's the woodworking project part that appealsd to me. It's been a long time since I've actually made something myself (that wasn't made out of PVC). So I've downloaded the directions, bought myself a beautiful piece of red cedar, a bunch of woodworking tools (all hand tools - no power for me), and I've even assembled a cadre of like minded souls to share the experience and hopefully some wisdom. It's a good winter project and if nothing else I should end up with something pretty to hang over the mantle place. Of course, I would never let building a paddle get in the way of actually paddling so I'm only working on my paddle one night a week after work. The first week was just figuring out the measurements, the second assembling my work bench and drawing the lines to guide my cuts. 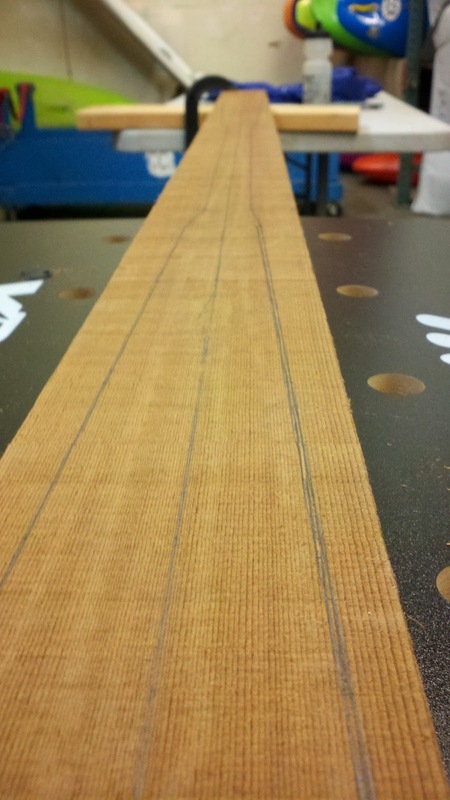 I've only completed the first cut now but the paddle has emerged from the 2x4 it was hiding in. I'm not going to keep a meticulous photo record of the project since that kind of thing has been done by others, but I will throw up some pics now and then on my photo page and I'll report on the outcome when the thing is actually finished. But it may take a while at my current rate. One of the downsides to working in a kayak shop is that you generally work weekends. Every weekend. So it can be hard to get together with friends to go paddling. Solution: go with friends from work! With a forecast for 50 deg and sunny for Lake Tahoe, a Tuesday with the shop closed, and a determination to not talk about work - a group of seven CCK staff and instructors (plus one significant other) headed up to paddle Lake Tahoe. This has become somewhat of a yearly tradition - Tahoe in the winter - though the people involved always changes. We drive up in the morning along the beautiful American River (a little too low to be runnable right now), have a nice breakfast in the Camp Richardson store before launching off their snow covered beach, paddle over to Emerald Bay (avoiding getting run over by the paddle boat), stop for lunch at Vikingsholm, then back to Camp Richardson and dinner nearby before the drive back down the hill. It's only about 10 miles of paddling and on glassy smooth water. But the point is not to challenge ourselves. We are not trying to push our limits or develop skills or even get a great workout. The goal of the trip is sheer enjoyment: to be surrounded by beauty in many forms, to have great conversation with friends; and to eat too much good food. The highlights of this trip include glassy water the whole day, the first time paddling Tahoe for one person, visiting the Tea House on Fannette Island, Lisa's gingerbread for breakfast (and lunch), finding the ice sheet at the end of Emerald Bay, and lots of great pictures. And in spite of the snow and ice (and an overnight low temp of 14 deg) most of us were actually too hot while paddling. 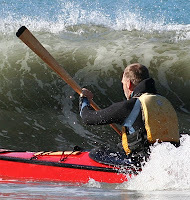 Never listen to anyone who says that kayaking is a seasonal sport - at least not in California! One of the great things about rivers is that they keep flowing until they either hit the ocean or we use up all their water (the second happening more frequently than desirable...). In so doing they can pass through very different geologies and geographies and can have many different natures. The Feather river starts high up in California's Sierra Nevada and contains some of the best whitewater to be found on the planet. The Middle Fork in particular has over 35 miles of class IV/V undisturbed by roads or man, cutting through the granite goodness of California's young mountains. Ultimately it escapes the mountains and lands in Oroville Lake, a man made reservoir created to help water our crops and control flooding. Below the dam the river becomes a mellow float with the occasional class I riffle before joining the smooth flowing Sacramento River on its way to San Francisco Bay. This section starts in the town of Oroville and is currently on track to become California's first truly man made whitewater park. As you follow the river and head out of town you enter the Oroville Wildlife Management Area. And this is exactly the path we took over the weekend. The sun finally broke through after weeks of clouds and valley fog and blessed our merry little band with clear skies but chilly air (California chilly = 45F). We put in at a beautiful riverside park in town and floated (paddled, really, since there wasn't a lot of current) through the wildlife area, taking out just before it ended and the farmlands began. While some of the bird life was undoubtedly scared off by the duck hunters (we were a little afraid ourselves after seeing the poor aim and control of a pair shooting from a canoe) there were still several of the largest white egrets I have ever seen to mark our progress. 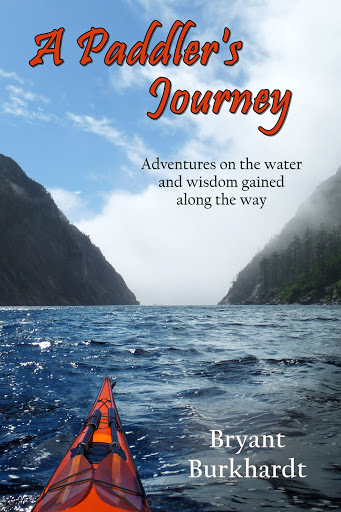 It was a great mix of people, from those who had never kayaked on a river (some who had barely kayaked at all), to those had years of rough water ocean paddling experience. Some nervous about the rapids, some disappointed there weren't more. Everyone was in sea kayaks (except for the couple in the open canoe) and the long boats helped make the miles go by a little quicker. It was interesting for me to be sea kayaking flat water on the same river that remains one of the best whitewater multi-day trips I have ever done. That particular trip has become legendary for being such a large group and making it to the takeout just as darkness fell (and other adventures). But the common theme that ultimately made both trips so enjoyable was the people to share it with. That's the true beauty of kayaking - who it brings together, not where you happen to be. More PICTURES HERE. So there's a right way and a wrong way to do most anything. Actually, there is normally more than one right way (and more than one wrong way for that matter). Too many times I hear people talking in absolutes - "my way is the one true way". And not just in politics - it happens in kayaking too. While there are points in technique, group management, etc. that are universally agreed upon there are also some points that are open for debate. The key thing for most people to understand is that many things are situational and the more 'right' ways you know how to do something the better off you will be. 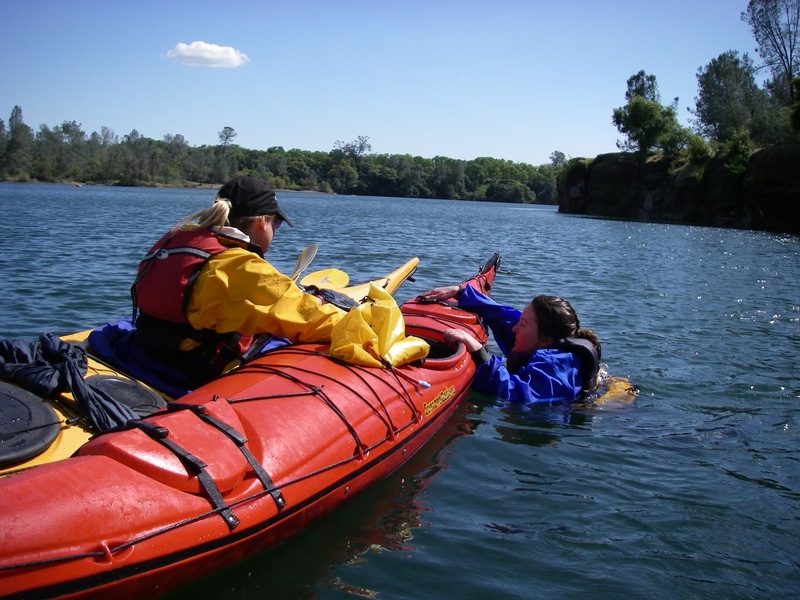 Don't just learn one thing because your friend does it that way or some supposedly famous kayaker does it that way. Learn to think and evaluate for yourself. One particular area this comes up is in regards to sea kayak rescues. The T rescue in particular has lots of little details in its execution that are open to interpretation. So when teaching the T rescue I focus on the things that are necessary and then get people to understand their options, each of which has advantages and disadvantages. Some would say that it is best to just teach one specific variation to keep it simple for students. The problem is that there are too many details - I've seen too many real life rescues that where people have enough trouble remembering the big points so trying to get them to memorize the little ones is unrealistic. It's only us instructors that really sweat the details - most folks just want to get back in the boat. 1. After the wet exit the swimmer needs to hold onto their boat and gear. 2. The rescuer needs to get to the bow of the empty boat and hold on with both hand. 3. The empty boat needs to be drug up the rescuer's boat to drain any water. 4. The boats should end up bow to stern and the rescuer must lean onto the empty boat to stabilize it. 5. The swimmer needs to get onto the back deck of their boat, belly down, facing the stern. 6. The swimmer slides their feet and legs into the cockpit then rotates towards their rescuer into an upright, seated position. During one rough water rescue class I saw two students practicing their T rescue. The swimmer flipped his boat over and lost his grip on it (another disadvantage). But luckily the wave action took him right to the stern of his boat. At the same time the rescuer moved in and a surge put the bow of the empty boat right in his lap. They were in perfect position to proceed to drain the boat. But because they had been taught (by a world famous instructor) to transfer the swimmer to the bow of the rescuer's boat they took considerable time to rotate the boats together, have the swimmer move around to make the transfer and then return to their T position. It was a complete waste of time and made things much more difficult than necessary. They were following dogma. They should have been thinking.